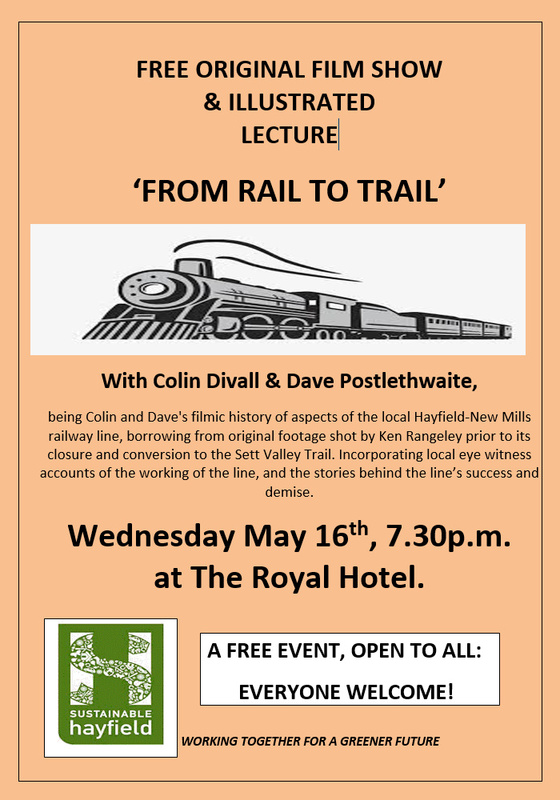 A reminder that tomorrow evening, Wednesday, at 7.30p.m., at the Royal Hotel, may be your last chance to see the newly-re-edited film account of the Hayfield to New Mills railway, using contemporary footage and featuring live interviews with local people, as the centrepiece of the illustrated lecture by Colin Divall and Dave Postlethwaite, entitled 'From Rail to Trail'. Colin and Dave's previous presentations were 'sell outs', and had to be foreshortened to accommodate all those people who turned up to the 'world premier' of this filmic account . We've stepped in, with Colin and Dave's generous help, to give all those who missed out first time around the chance - free - to see this unique material and learn about the success and demise of this local line. We can't guarantee there'll be another such local opportunity. Will you be there? There's plenty of space at The Royal. 1. This Saturday is, of course, May Queen Day. Sustainable Hayfield is to have a 'walking procession' in the parade, which really just consists of a number of us walking in Sustainable Hayfield's bright green (of course!) T shirts, with several people carrying one of our banners. We've already got a few people signed up but would welcome more. Have you a little time to spare, and quite fancy being part of the parade? If so, please contact Laurie James, so we know how many T shirts we'll need. We'll meet at the bus station at 1.00p.m., and the parade moves off at 1.30p.m.. It's about 45 minutes' slow walking, and then off - to home or to the crowning ceremony or the Fair. We want to support the oldest continuous procession of its kind in England and this year, the more so, since the May Queen Committee is making a particular effort to encourage people to separate out their waste, promoting recycling. 2. You may know the Civic Trust some weeks back organised a presentation by Colin Divall and Dave Postlethwaite, both Sustainable Hayfield supporters, which was in effect a world premier of some filmic representation of the Hayfield to New Mills branch railway line, edited from original footage shot by Ken Rangeley, and featuring live eye witness accounts of the railway. Entitled 'From Rail to Trail', reflecting the line's eventual closure and incorporation into the Sett Valley Trail, it was a great success. More folk turned up than could be seated, and so two shorter sessions were organised, with many people asked to return an hour or so later. And still others didn't know or couldn't make the event, a unique representation of Hayfield's history! So we've stepped into the breach and, with Colin and Dave's generous agreement, we're hosting 'From Rail to Trail' next Wednesday evening, May 16th, free of charge, at The Royal Hotel, 7.30p.m. This may be your last chance to see this unique account of the railway line, and the stories behind its success and demise. You - and your children - are very welcome to join us. We hope for a good turnout, but there's good capacity at The Royal, so we hope will be able to view in some comfort. See you there?